handmade books 36-38 by darkest-red, on DeviantART. Today, rather than talk about how to write a book, I want to talk about how to bind one--how to, literally, create your own book. In the first part of this post I go over how to bind a simple blank book. Then we'll talk about how to print out your story for binding. Rather than go through this myself I'm going to point you to excellent articles, and a video, that document the process. So, now that we know how to bind a simple book, let's look at how to print the pages of your story so they can be easily assembled into signatures. In just a moment I'll give you links to two articles which give excellent instruction about how to do just that, but the idea is very simple. 1. Decide how many pages/folios you'd like each signature to contain. Now that we know how to bind a simple book, let's look at how to print the pages of your story so they can be easily assembled into signatures. In just a moment I'll give you links to two articles which give instructions about how to do just that, but the idea is very simple. For my blank journals, each signature is comprised of 10 folios and each book I put together has 10 signatures. For a printed book, though, the number of folios each signature contains will depend on the length of your book, as well as the size/dimensions of the book. For example, a book the height and width of a mass-market paperback will, all things being equal, require either more folios per signature or more signatures (or both) than a book the size of a hardcover. 2. Decide how many words you want per page. The number of words which will fit on a page depends on the font you choose as well as the font-size. You will then need to figure out how to print your story so that when the signatures are assembled into a book the pages are in the correct order. There are programs--InDesign for example--which will do this. You simply need to tell it how many folios you would like per signature and it will collate the pages accordingly. If you're a DIY type of person (like me!) here are a couple of articles that step you through the process. How-To Create Booklets Using Microsoft Word 2010 by Austin Ruthruff over at groovypost.com. How to Make, Print, and Bind Your Own Books, by Thorin Klosowski over at Lifehacker.com. Photo credit: "handmade books 36-38" by darkest-red, on DeviantART. I hope you do! 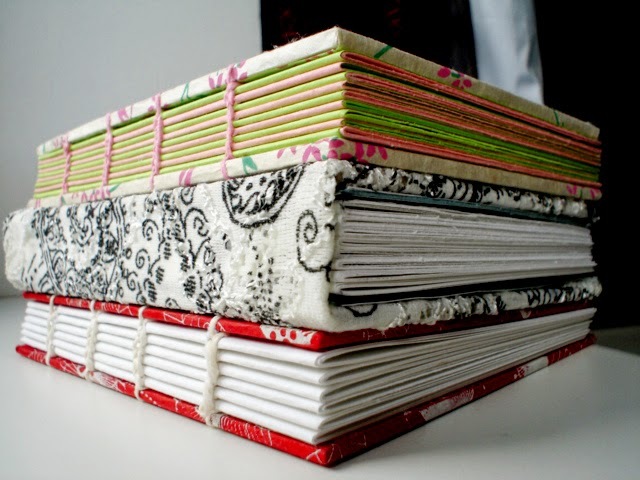 Making journals is also a great way of recycling. Some journals I try to make solely from things around the house, it helps me see ordinary objects in a different way.